The car mount fits most sizes (2 inch-3.5 inch) of smart phones including iPhones, Samsung Galaxy, LG G4, Nexus 5X, HTC M9, etc. With 2 USB charging ports, this car charger allows you to charge two devices simultaneously. Note: Smartphone is not included. Output: DC5V 3A, Input:12-24V. 2 in 1 car charger and holder, Cigarette lighter adapter with Dual Charging USB ports. 360 Degree Adjustable Design: A small round ball ensures 360-degree rotation, adjust direction at your will. The holding gooseneck can be adjusted by a regulating knob with 180-degree adjustment. Allow you to position your phone or GPS horizontally, vertically, or tilt in any direction, provide the optimal viewing angle, view your device at any angle or orientation while driving. 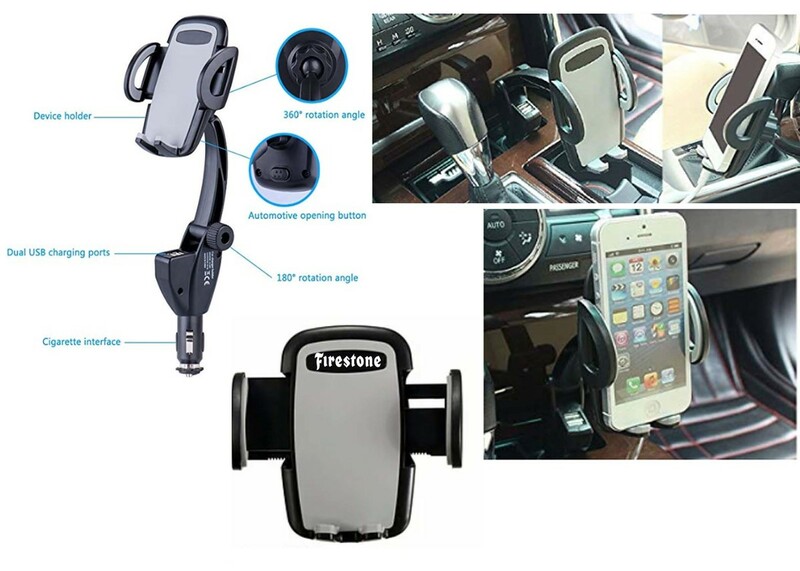 This car charger holder is an essential accessory for your vehicle to be able to navigate and charge your phone for convenient and safe driving. Equipped with the technology to protect against short circuiting as well as over current and over voltage. It provides maximum reliability without compromising charging ability or taking up unnecessary space.